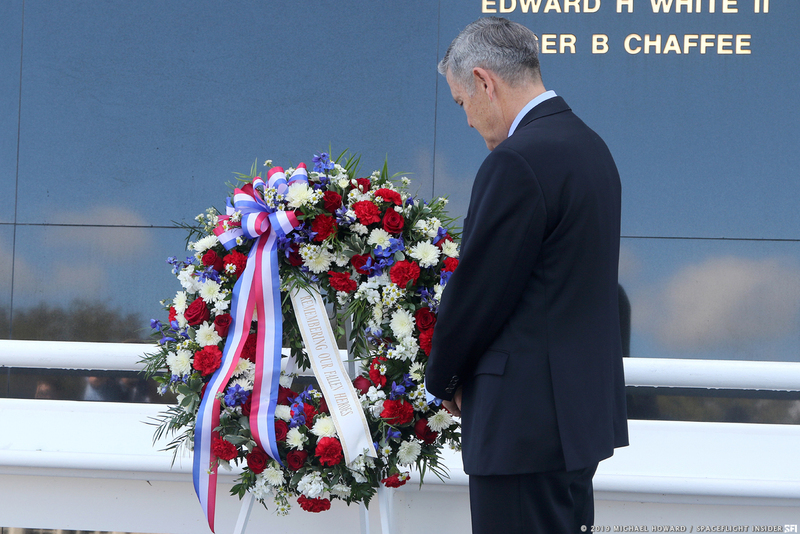 KENNEDY SPACE CENTER, Fla. — Today, NASA paused to reflect and remember those that gave the ultimate sacrifice in pursuit of the exploration of space in its annual Day of Remembrance ceremony. 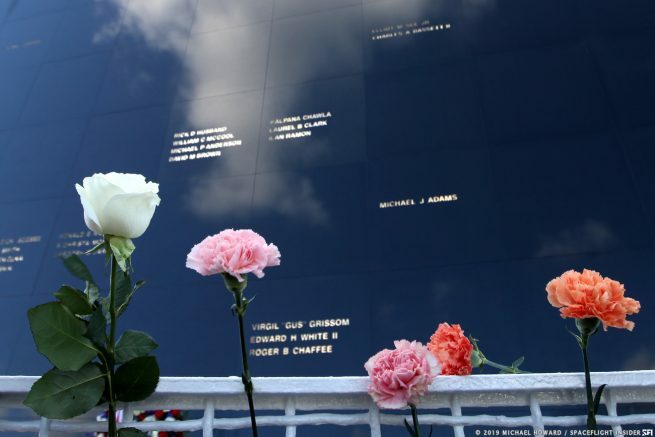 The remembrance service occurred the morning of Feb. 7, 2019, in front of the Space Mirror Memorial at the Kennedy Space Center Visitors Complex. It was open to visitors of the Complex and each guest was given a flower that they could place at the memorial at the conclusion of the ceremony. Each year, NASA holds a Day of Remembrance ceremony around the anniversary of the three major accidents in the U.S. space program: the Apollo 1 fire during a “plugs out test” on Jan. 27, 1967, the STS-51L Challenger launch breakup on Jan. 28, 1986, and the STS-107 Columbia re-entry breakup on Feb. 1, 2003. Attending this year’s ceremony and guests of honor were Kennedy Space Center Director Robert Cabana, KSC Associate Director Kelvin Manning, Executive Director and CEO of the Astronaut Memorial Foundation Thad Altman and Sheryl Chaffee, who is the vice-chair of the Astronaut Memorial Foundation board of directors and the daughter of Apollo 1 astronaut Roger Chaffee. Opening the ceremony and bringing the invocation was Father Blake Britton of Saint Mary Catholic Church in Rockledge, Florida. Altman went on to remember the words of Gus Grissom before the Apollo 1 fire in 1967: “The conquest of space is worth the risk.” He then read, one by one, the names of those who were lost in the pursuit of space. 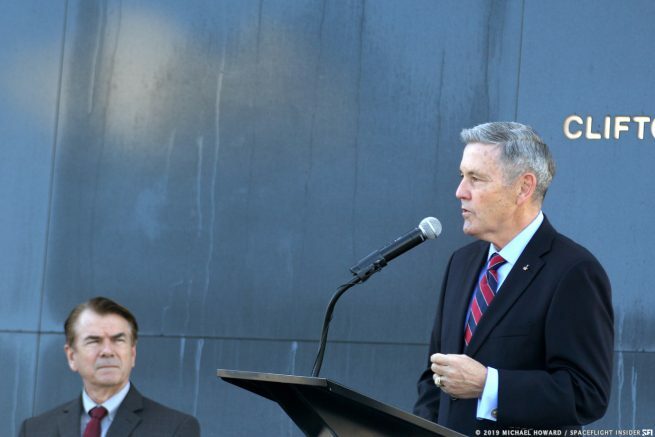 KSC Director and former astronaut Robert Cabana, ahead of a wreath-laying ceremony, spoke of the continued importance of this time of reflection and day of remembrance. Cabana spoke of the future of human spaceflight with crews soon to launch aboard new rockets and spacecraft from U.S. soil. Mike Howard was born on Florida's Space Coast in 1961, growing up on the beaches near the Kennedy Space Center when rockets first started to fly into space. As a small boy, one of the first photographs he took was in July 1969 - of the Apollo 11 launch to the Moon with his father's Nikon. With over 20 years of professional photographic experience Howard has been published in various media including Florida Today, Air and Space Magazine and has worked with SpaceX and Space Florida as well as other news outlets. In 1998 his company started offering destination wedding photography services in the Cocoa Beach area and in 2005 Michael Howard Photography L.L.C. was formed.